Open Water is the first step in your scuba diving adventure. This course is the foundation of all of your future scuba diving endeavors. Stuart Scuba will start your course with a classroom review of the academics you learned via home study. Both eLearning and print books are available. Once you have completed the classroom session you will move on to the confined water training. Confined water training is where the real excitement begins. You will familiarize yourself with your gear and learn how to safely use it. Stuart Scuba confined water sessions are held at either the Sailfish Splash Water Park or the famous Blue Heron Bridge. Once you have completed your confined water training you will move on to the final stage of your course: open water diving! This will include diving off of one of our boats, learning boat diving skills, and enjoying your first drift dive on Florida's world famous reefs. Open water referral is for students that have already completed their academic studies, classroom training, and pool session at their local dive shop. If you wish to complete the open water portion of your training in the warm beautiful waters of sunny South Florida and drift dive in our world famous reefs, then this is the program for you. Often times, divers live in land-locked or cold regions and want to enjoy the warmth and beauty of reef diving, or perhaps are planning to dive while on vacation. Look no further than South Florida to complete your open water training. 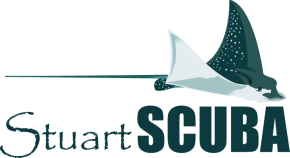 Stuart Scuba welcomes those that wish to dive with us from less dive-friendly environments. Referral programs are also a convenient way to do all of the academics and confined water training at home before leaving for a dive-filled vacation. You can then relax and just enjoy the diving portion of your training in our breathtaking reefs. Please contact Stuart Scuba, and we will help you make arrangements for the referral program with your local dive shop. Referral program includes the opportunity for Discover Nitrox on dive #4.